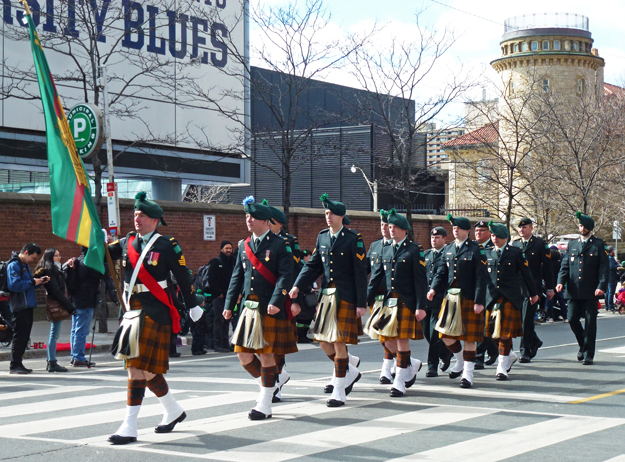 I couldn't leave off my pics from the St Patrick's Day Parade without posting this one of these men in great looking kilts. I really like that tartan they are wearing and the whole group looks so handsome all in step. Those are some of the buildings from the U of Toronto behind them. They do look like a handsome group. I am still surprised about the one I met on the beach in the beginning of March. It was freezing cold. From their uniforms, I'm assuming they're military. This is a very smart looking group. Though I know it will shock you, men in kilts don't do anything for me. But, I absolutely love bagpipe music, so if they are playing pipes, the kilts are OK.
Those are really neat marchers! I like strong men in kilts. Yes, a parade and they are so very handsome as well! Un gran desfile y todos muy guapos! !